I am really loving these new S.W.A.L.K. Pawfect Pals stamps but then again I love all the S.W.A.L.K. stamp sets. (Seriously!!) As soon as I received my stamps I got to work stamping out images and coloring with my Spectrum Noir markers. I have colored so many of these new images it was a bit hard to decide on which one I wanted to feature as my Tuesday Project for Crafter's Companion. But then I realized that I had the perfect image colored for my next anniversary card for my husband. I love it when a plan comes together! So here is a card I made using the Quackers stamp set. And since the card was made for my anniversary, I thought I should go ahead and make a matching box for my husband's anniversary gift. 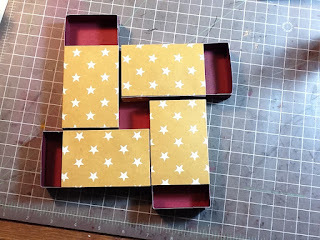 Boxes are so easy to make with the Ultimate Tool. Why don't I show you? You just start with two pieces of paper the same size. 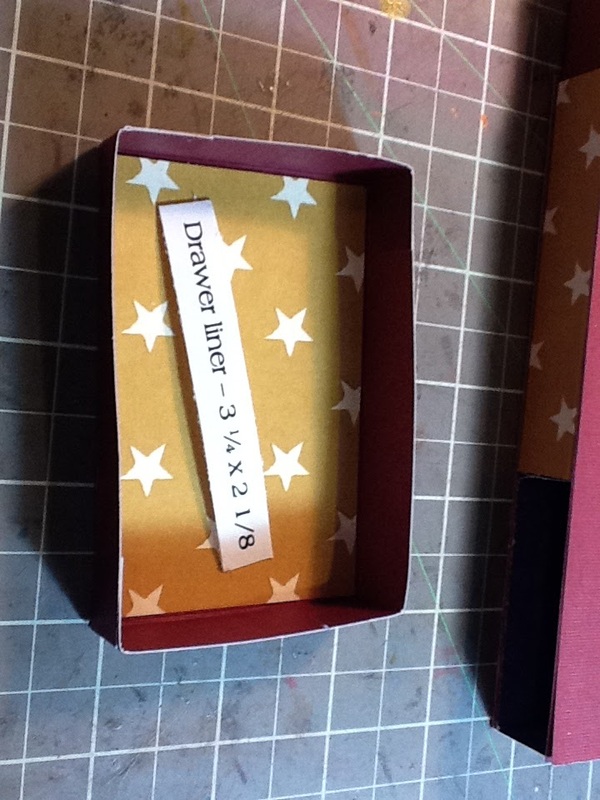 Now you need to adhere the sides on both the box base and box lid. Flip your paper over with the outside facing up and put glue on the little tabs you made in each corner. I use a wet glue because it gives me time to move things around if I need to. Align the tabs with the sides and hold in place with a paper clip until your wet glue dries. I decided finish off my box with a flower that I die cut with my new eBosser. 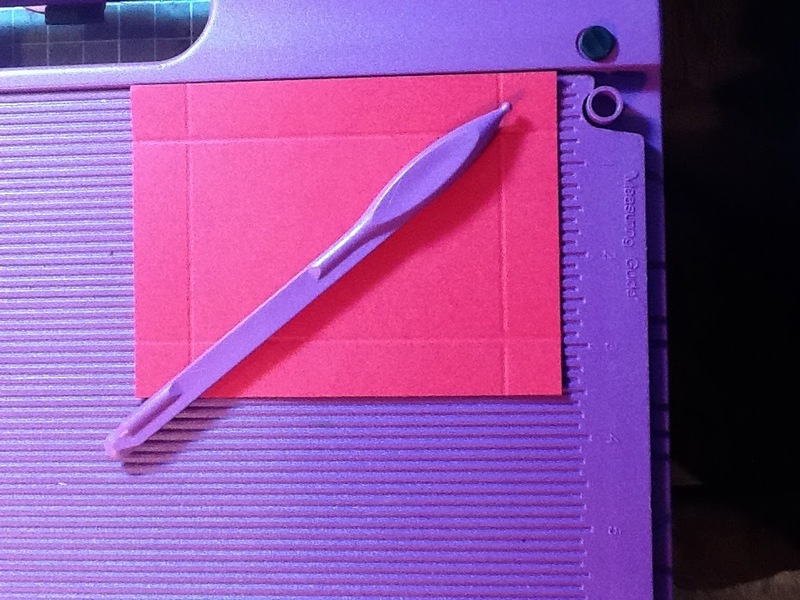 (Shhh don't tell my husband about my new eBosser!) I adore this new machine because it is so easy to use. When you want to make something you just pull out the instruction booklet which has recipes for dies and embossing folders and find the one you need. For my Thin Metal Dies I started with Platform D on bottom, then I added a shim. Next I layered on Platform C, then Platform B. On Platform B, I put my Cutting Die with the patterned paper on top. Finally I put Platform A on top of everything. I turned on the machine and started sliding the boards into the machine until it caught hold and took over for me. It cuts smooth as butter! Here are a couple of shapes that I cut out for this project. I cut out 5 graduating sizes and layered them for my flower. I colored a gem with my Spectrum Noir markers to color coordinate and added it to the center of my flower. Here is the card and box together. 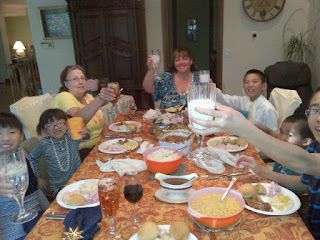 I guess it is a good thing my husband doesn't read my blog posts! Here are the Spectrum Noir markers that I used to color this stamp. It seems like I used most of the ones I own! Thanks for stopping and looking. Until next time...happy scrapping. I have a couple of fun cards to share with you today using some toppers from the Mulberry Wood Classic Christmas Luxury Card Collection. I was lucky enough to get a sheet of these super cute die cut toppers in the mail last week. I love happy mail, don't you?! I immediately went to work making some cards. These toppers come in the kit on 8 different sheets with about 7 toppers per sheet. They co-ordinate perfectly with the Mulberry Wood CD-ROM and the stamps sets. The card making kits also come with 16 foiled and unfoiled card blanks. For these two cards I did not use a card blank because I was actually cleaning off my scrap desk and the last two bits left from my last project were a piece of green pattern paper and a trimmed bit of white card stock. ﻿So in my head I thought, "Hey, why don't I just make a quick card base out of these scraps"? The pieces were almost perfectly sized already so it was really a no brainer. The green paper was double sided and had green stripes on one side and green polka dots on the other. 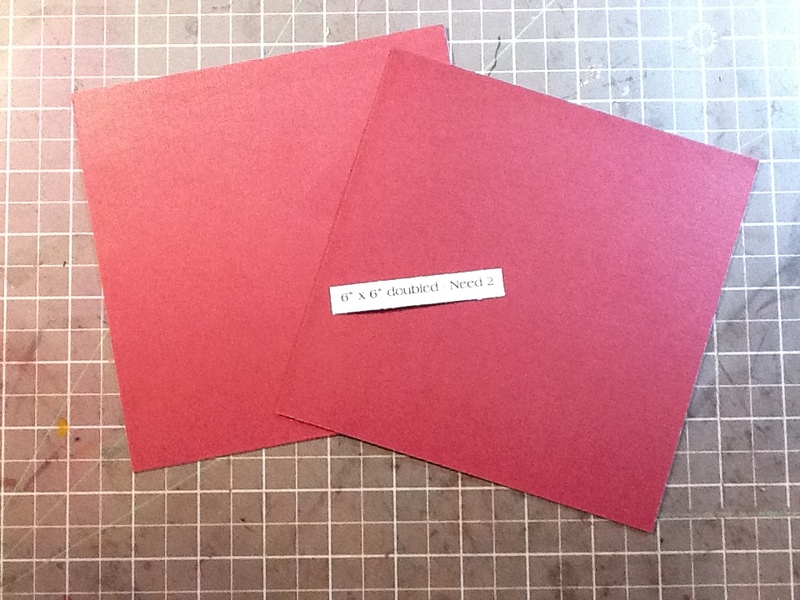 I took the white card stock and trimmed it a bit shorter on the front that on the back. I adhered the polka dot paper down on the front after gluing down a bit of shimmery green ribbon from my stash. I pulled the ribbon around and tied it into a bow on the front. Then I opened up the card. I turned my green patterned paper over to the stripe side and trimmed off a bit to fit on the bottom of the inside. It was already starting to look pretty cute even without a topper! ﻿I grabbed them and immediately saw the one I wanted to use on this card. The sweet Santa topper was perfect. I used some double sided adhesive squares on the back of the topper to adhere it to the card giving just the right amount of extra dimension. Then I pulled out my coordinating stamp set - Mulberry Wood EZMount Stamp Set - Dreams of Santa. I used two sentiments from this set for my card. One of them I stamped on a bit of white card stock leftover from when I trimmed down the card front. The other one I stamped on the inside of the card. To finish this card I trimmed the sentiment for the card front into a flag and then added some bling that I custom colored with a Spectrum Noir marker. Done! Super fun, super quick and super cute! ﻿Later in the week I was finishing up another card for a Sketches4all December challenge, again cleaning off my scrap desk, when I got down to a piece of Pearlescent Blue card stock and some white card stock. I decided to do it again! I trimmed down the piece of white card stock a bit shorter in the front so that the patterned paper I put along the bottom on the inside would show. This is something I have been obsessing on lately. I'm not sure why but I have a stack of cards to attest to it! ﻿I layered the topper onto the blue pearlescent card stock and the adhered it to the white card base with double sided adhesive squares for dimension. I used a snowflake punch on the bottom edge of the front and then trimmed a thin piece of the blue paper to go over it. I pulled out the Mulberry Wood EZMount Set - Merry and Bright stamp set and stamped out two of the sentiments. I stamped out one on the inside and then I stamped one onto a piece of snowflake patterned paper that I taped down to the bottom front of the inside of the card. This sentiment shows with the card closed and when you open the card you can see both of the sentiments. To finish up this card I glued a few snowflakes on to the topper. (leftover bits from punching with the edge punch) Then I rubbed on two snowflakes to the inside. Done! All of this typing makes it seem like these projects took a long time but they went together so fast and easy and they turned out so super cute! Hopefully you think so too. For our Monday holiday we mostly did school work projects. Yeah, I know...not so fun. But at least we had a whole day to focus on some big projects and get them done without totally stressing out. See...a totally kid oriented weekend!! Thanks so much for stopping and looking today. Until next time...happy scrapping!! Hi! I've made a few cards and wanted to share them. 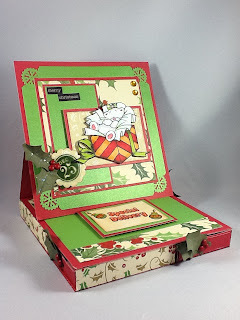 As you will know if you follow my blog, I'm taking a class right now at Online Card Classes - the Holiday Card Workshop. I love their classes!! I haven't taken a bad one yet. I have been so inspired to scrap while taking this class. So...here are a few of the cards I have been inspired to make. The first one is a Christmas card that I made using some snowflake stamps and Ranger Distress Ink in Peacock Feathers, Iced Spruce, Shabby Shutters and Tattered Rose. The sentiment was a freebie in a magazine and I have no idea who it's from (?). I finished it up with a little Crystal Stickles for sparkle. Next we have a Thank You card using a ton of sentiment stamps. I'm not totally loving this one but I do like the idea of it. I will probably it try again with hopefully better results. And finally here is another Christmas card. The stamp is one my BFF got me last year for Xmas. Isn't it sweet? I used papers from my 6x6 Basic Grey Aspen Frost paper pad. These papers are so pretty and most of them could be used for other times of the year. I love that. I colored this with my Copic markers. I ran glue down the top and bottom edge of the colored image and dipped it into glitter. I'm not sure how well you can see it so here is a close up. I'm not sure if that helped or not. It looks cute in person. 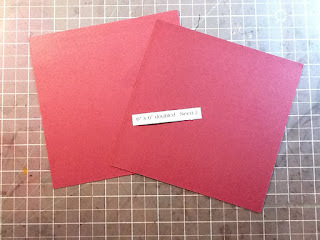 To finish I used a Martha Stewart edge punch on the red paper and used my corner punch to round the corners. I've been on a roll lately!! lol I got some new SWALK stamps last week and I have been coloring away. They aren't released yet so you will have to wait to see them. Super cute!! We had a cool down here today in Las Vegas...I think it might be in the 70's! (woo) We are so spoiled. I'm going to enter these in a few challenges but I don't have the list in front of me right now so I add them in a bit. Thanks for stopping by today. Until next time...happy scrapping!! I love that it can easily be used in conjunction with my Ultimate Tool or by itself if you aren't lucky enough to own an Ultimate Tool. And it can be stored inside your Ultimate Tool for easy access. Let's start with a photo of my finished project. Isn't this the coolest thing? 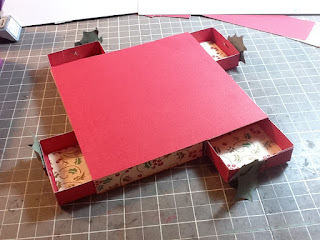 It was so fast and easy to make that I plan to make several of these in holiday colors and put goodies and gift cards inside to give at Christmas. But I get ahead of myself! lol Let's talk about how I made this one. So first thing I did is I pulled out my Ultimate Tool and sat the board in between the pegs. Then I pulled out some card stock and trimmed it to easily fit on the board. You don't have to do this step but it does make embossing easier. Then I started embossing the shape of the bag I wanted to make. Easy. 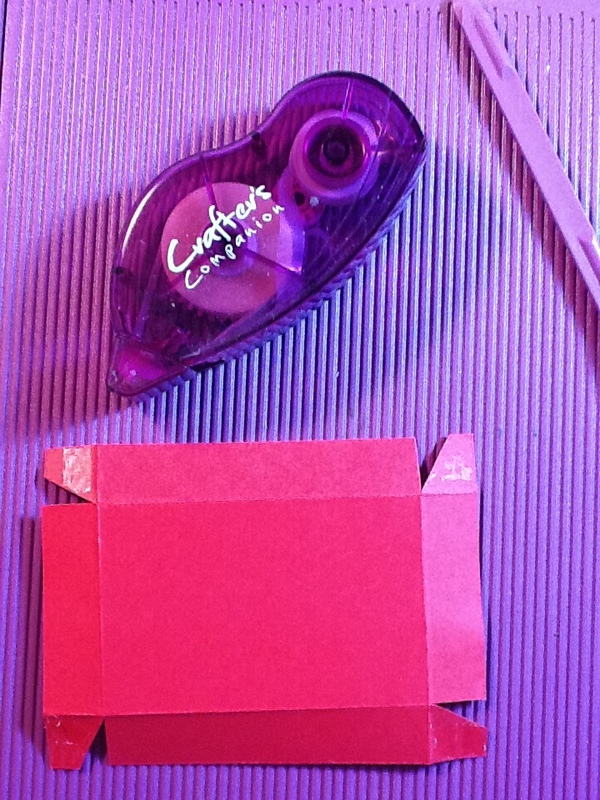 I didn't have any trouble but if you want you can use the awesome Crafter's Companion Spray and Slide Embossing Lubricant on the back of your card stock. You just spray the back of your paper or card stock, let it dry for approximately 30 seconds and then start embossing. Your embossing tool will simply glide across the surface; giving you a smooth and consistent design. 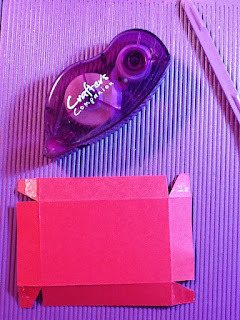 After embossing the bag shape, I took out my scissors and cut just outside of the embossed line. Then I folded all the embossed lines in the middle. Next I put a wet glue on the back of the tabs. You can use other adhesive if you want. I used the wet glue because it gave me time to reposition the tabs if I needed to do it. Finally I folded the bag together, pulling up the side flaps and attaching them to the bag sides. Now all I needed to do was embellish! This board is so awesome! It is double sided with two bag templates and includes co-ordinated tags, banners, swirls and more. For my project embellishments, I decided to use the board for pretty much everything! lol I embossed out the shapes I used on the bag front in graduated sizes in complementary card stock. I also did the same thing with one of the banner shapes to use for the bag closure and I embossed the smallest tag shape to use for my sentiment. To finish the project I just had a few things to do. I pulled out some bling from my stash and used a Spectrum Noir marker to custom color it to match. Then I added a sparkly green brad from my stash to the enclosure piece and I adhered some velcro for easy opening and closing. The last two things I did were to add a sweet little purple flower by the bling and to hang my sentiment to the bag handle with some ball chain. And there you have it...my completed project! What do you think?? Like it?? Want to see something else I made? I decided to work on a Sketches4all tag challenge. The challenge is to use Metal. I started with a black tag base. I stamped and heat embossed a bird image onto it. Then I pulled out my new Tim Holtz Distress Stains in metallic colors -Tarnished Brass, Brushed Pewter and Antiqued Bronze and randomly rubbed them on the tag. Then I spritzed the tag with water. I let it dry. Next I pulled out my TH Distress ink pad in Peacock Feathers and starting on my craft sheet, rubbed the ink onto the tag with my ink tool. I randomly stamped some stars on the tag and then added some more Distress Stain in Brushed Pewter. You can tell I really liked the silver and blue together. ha I pulled out some ribbon I have from Michaels that looks like flowers on a roll. It comes in white so I cut off one of the flowers and used that Distress Stain again to color it to match my project. I had some lace in my stash in turquoise that I felt worked perfectly so I cut a small piece of it and then I stapled it onto the tag while randomly folding it. (The staples are my "metal" bit) I adhered my flower on top and then with a Spectrum Noir marker, I colored some peel off border stickers that are edged in silver and used their triangle shapes as the "leaves" for my flower. Finally to finish, I pulled ribbon from my stash for the top and to put along the bottom. For the top, I lightly brushed over my silver ribbon with my ink took that still had a bit of that Peacock Feathers ink on it. It was a little too silver and that toned it down and helped it go better with my tag. The last bit of turquoise ribbon looks like it was crocheted and works perfectly on the bottom of the tag. Now to end. I want to share with you a little of the craziness I get when I try to get a "pretty smile" from my dd. I finally smile and mom takes a blurry photo!! Okay enough for today. Until next time...happy scrapping! I was feeling extra scrappy today so I have been camped out in my scrap room for most of the day. I did my Tuesday DT project for Crafter's Companion then I went to work on some challenges on Sketches4all. 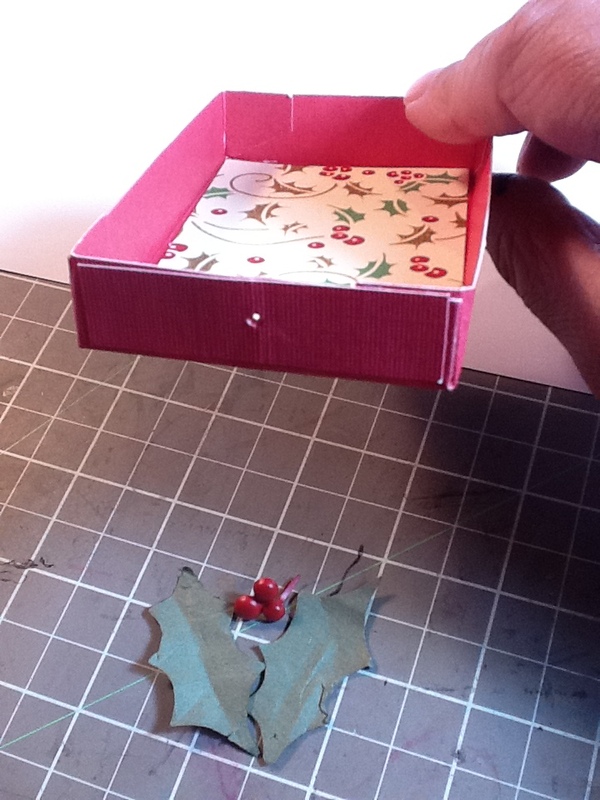 After I made the tag, I started on Chery's Holiday Challenge #12 - make a Christmas card. Easy right? 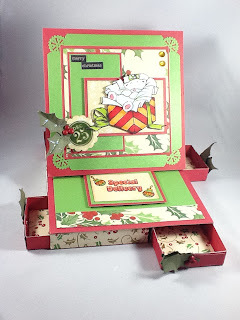 I'm taking the Holiday Card Workshop from Online card classes and was totally inspired by the class to make this card. I love their classes!!! I made a couple of masks of my stamped image by stamping out the image and cutting away the bits that I needed. Then I used them on the image I stamped on the card then I colored with my Tim Holtz ink pads. Here is one of the masks on top of my stamped image. Here I am inking the image. I cut another mask that I used for the brown and grey that I used. After inking with the TH ink pads, I used a Spectrum Noir marker to color the legs of the bird. And another one to color around the image and to make a bit of a shadow on the ground. GB10, IG1 and IB1. 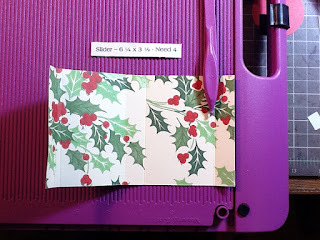 And following the tutorial from my online class, I trimmed off a bit from one side of the card and then used scrap paper pieces adhered to the inside of the card to peek out from under the cut edge. To finish, I stamped a sentiment on to the front and also the inside of the card. Well, almost to finish, I also stamped and heat embossed some snowflakes to the inside too. And added a bit of crystal stickles to the stars of the stamped inside sentiment. And this brings me to the next challenge, Cheryl's Challenge #15 -The inside story. This challenge is to finish the inside of a card. I finished out the inside of this Christmas card. Hey, did you guys have a good Halloween yesterday?? My kids did! Well, except for my 6 year old son, he made it about halfway down the block when he froze up, crying, asking to go home because he was too scared. Our neighbors are very creative in their decorating and really just go all out with the scary stuff. So my brother took the other 4 kids trick or treating and the Riley and I went back home and gave out candy. You should try to walk down the sidewalk with a child with his hand over his eyes!! lol It made it a bit of a challenge. My oldest daughter took Riley's candy bag with her and trick or treated for him. So he ended up with a full bag of candy!! The 3 little ones had a Halloween Parade at school in the afternoon and since littlest one has morning preschool she wasn't included however when her teacher's afternoon class marched by they grabbed us out of the crowd to join in the fun. So I was lucky enough to get to walk in the Halloween parade and do all the fun dances that the kids had been practicing for weeks!! (eek!) lol They had a blast and it turned out great. Starting today, expect to see more creative projects from me because I will be having much more free time to scrap. WOOT! Crafter's Companion has gone in a new direction and they have a new Design Team Coordinator ALSO the Crafter's Companion USA Challenge blog was closed AND the UK Crafter's Companion Challenge blog has now gone GLOBAL! So many changes!! Crafter's Companion is really a global company so it makes more sense to have it be a bit more centralized with one specific person over all of the Social Media. (blogs, FB, etc) I will still be on the design team for both sites but just won't have all the extra work. So it is all good!! There is a new November Challenge that started up today in fact! You should go check it out! They will be sharing my project later in the month.